(CNN) -- The mayor of Venezuela's capital on Wednesday ended a six-day hunger strike protesting the government of President Hugo Chavez. 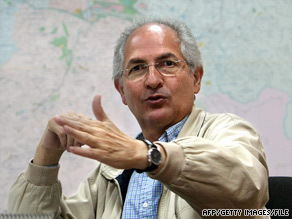 The OAS secretary general asked Caracas Mayor Antonio Ledezma (shown in February) to end his hunger strike. Antonio Ledezma, mayor of Caracas, had been carrying out his protest inside the offices of the Organization of American States, where his demand was for the inter-American body to investigate allegations of illegal power-grabbing moves by the federal government. Ledezma's wife made the announcement at a news conference Wednesday. Video showed crowds of people surrounding the mayor, who had a Venezuelan flag draped on his chest, as he was moved on a stretcher to an ambulance. The secretary general of the OAS, Jose Miguel Insulza, called the mayor on Wednesday urging him to end the hunger strike, the Globovision network reported. In an earlier conversation, Insulza told Ledezma he was willing to meet with a delegation of Venezuelan mayors and governors to hear their allegations against Chavez. Chief among Ledezma's complaints was the creation in April of a "head of government," appointed by Chavez, who took over many of the metropolitan mayor's duties, in addition to offices and budget. As a result, Ledezma said, his office does not have enough money left to pay all of his staff. Several workers from the mayor's office joined him in the hunger strike, according to the mayor's Web site. The workers have also ended their hunger strikes.